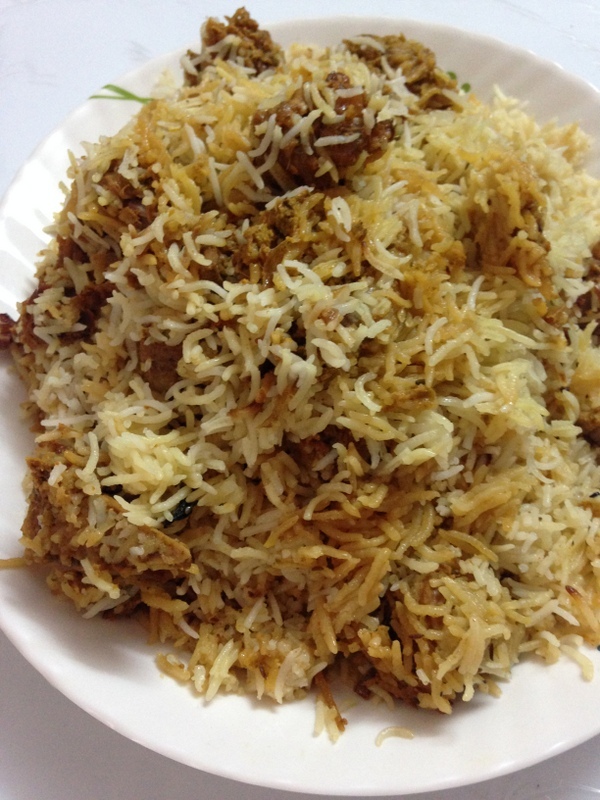 Mutton Dum Biryani Recipe is again a different variation of mutton biryani where the mutton is dum cooked and is almost similar to Hyderabadi Biryani and it is also a hyderabadi mutton dum biryani recipe. This mutton dum biryani recipe is cooked with the help of the steam itself but here long marination is not required and placed on dum with tightly sealed and more spices have been included. Here I have used raw papaya paste to tenderize the mutton and did not marinate the mutton for a long time. The recipe requires less time as meat tenderizers help in cooking the biryani fast and selection of fresh red meat is very important for perfect biryani and fresh biryani. In my hyderabadi mutton biryani recipe earlier I have not used the tenderizer and marinated for a longer time but not everybody can wait for such a long time to cook. So here is the mutton dum biryani recipe which does not require patience and can be cooked quite easily just with the help of a tenderizer. 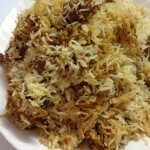 Every biryani recipe requires fried onions and here is the recipe on how to fry onions for biryani recipe. If tenderizer is not added and directly placed the biryani for dum then the mutton inside the biryani would remain harder. So while making mutton biryani in dum method there are certain points that should be kept in mind. 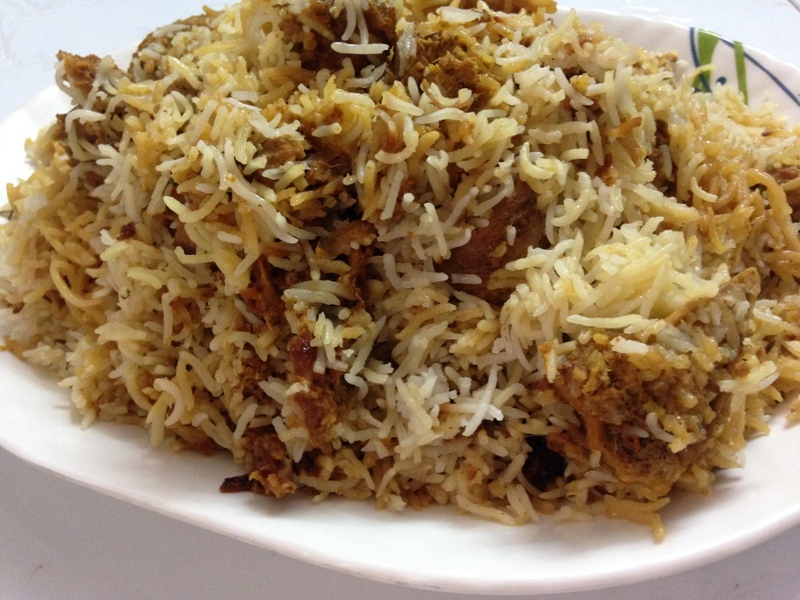 If tenderizer is not added then it is better to follow my hyderabadi mutton biryani recipe procedure. If meat tenderizer is added then follow the details mentioned in this recipe. 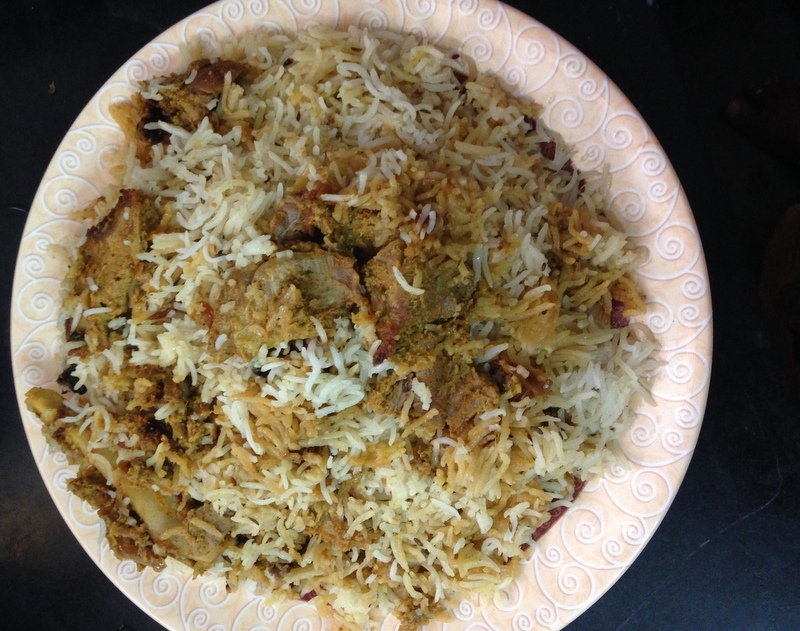 Biryani recipes be it chicken or mutton can be made in various ways and in hyderabad for dum method we say as kachhi yakhni biryani or kachhe gosht ki biryani and if the mutton is cooked before to make biryani then it is called as pakki yakhni biryani. Yakhni is the mutton marinade or the masala gravy in the biryani. Biryani is all about spices and flavor and a mix of many ingredients. Biryani making appears to be a long process but I feel making biryani is the easiest and simple once we get hold of the technique in making it. The meat tenderizer makes the mutton so soft that the mutton piece just melts in your mouth and this is way the dum biryani is made in restaurants and you can buy meat tenderizers from market if raw papaya is not available. Firstly, in a large vessel, add washed mutton pieces, salt, red chilli powder, turmeric powder, ginger garlic paste. Into the marinade add cinnamon stick, cardamoms, cloves, black pepper corns, nutmeg powder, mace powder and mix well. Add green chilli paste, mint leaves, coriander leaves, crush the deep fried onions and add into it. Add raw papaya paste, add oil and mix it well. Rest this marinade aside for about 1 hour. After marination add beaten yogurt into the marinade, add garam masala powder, add lemon juice and mix well. Wash basmati rice and soak the rice in water for about 40 minutes. In a cooking pot, add water generously for about 10-12 cups or more than that. Add whole spices that are cinnamon, cardamoms, caraway seeds, cloves and black pepper corns. Add oil and lemon juice into it. Bring the water a boil. Add the soaked rice into the boiling water. Cook the rice until it is 60-70% done. Strain the rice completely and put it aside. Take a cooking pot in which Biryani is cooked. Coat the base of the pot with oil. Add the mutton marinade into it and spread it evenly. Add the rice over the marinade and spread it evenly. Over the rice season it with saffron flavored milk, mint leaves, corinader leaves. Add lemon juice all over. Add crushed onions all over the rice. Top it with some desi ghee. Cover the lid and seal it tightly with a dough or put heavy weight on the lid. Place a skillet/tawa on the flame. Place the cooking pot on the tawa. Dum the biryani for about 15 minutes on high flame. Reduce the flame to sim and dum the biryani for about 35 minutes on sim flame. Dig the biryani from one side of the corner. The biryani should be taken out with a spatula from the bottom to the top. Serve the mutton dum biryani with raita!!! 1.Adding raw papaya paste works as a meat tenderizer and is usually added to mutton dum biryani. 2.If raw papaya paste is not available then meat tenderizers are easily available in super markets. 3. If the tenderizer is not added to mutton then the mutton does not become soft while giving dum. 4.If tenderizer is not used then mutton has to be marinated for about 4-5 hours. 5.Spices such as mutmeg and mace are totally optional. 6.Placing a tawa below the dum pot prevents the biryani from burning at the bottom. 7.Adding oil in steps does not make the biryani dry. 8.Desi ghee gives the fragrance to the biryani. 9.Spices added can be increased or reduced according to one's taste. Thank you so much…This has been the best feedback so far…Thanks a lot Uzma for trying out the biryani and giving such a wonderful compliment…Indeed its the perfect hyderabadi dum biryani…. I tried the chicken biryani with the procedure you explained. It was so perfect that I had to eat the whole biryani in 2 installments afternoon and night.And the saddest part of all is there is no one to share my biryani at that time else I would have got lot of compliments. I missed them all. Now I am writing here because I just wanted to prepare mutton biryani in the same way. As the above comment suggests that all the ingredients are so perfect I have to give it a try. Hi thank you for the recipe! I am just trying it out. I don’t have access to raw papaya or meat tenderiser. I have marinated the mutton overnight. Do you think I can still use it raw for the biryani or would it be risky? Thanks a ton! Yes athira it will come out well as raw papaya acts as a tenderizer…No need of marinating overnight…Just 2 hours marination is enough. Awesome recipes Asiya.. my family is a big fan of yours . They love every dish that I make looking at your recipes.. Thank you so much! We tried this and it was really perfect.. I have tried dum biryani for first time and couldn’t believe it turned out so good.. thanks alot for the wonderful recipe..